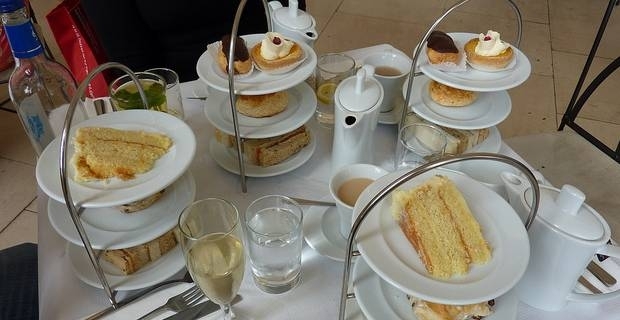 The fine old hotels of England specialise in elegant tea and cakes in the afternoon, but the experience can be pricey. A few time-tested afternoon tea recipes can allow you to create this most civilised of British traditions in your dining-room. If you can't run to a string quartet, a CD will suffice. Afternoon tea recipes are never complicated. Simple elegant teas require three basic elements: tea, sandwiches and home-baking. That sounds easy, but there are potential pitfalls. This is not the time to break out the mugs, crusty sourdough and chocolate muffins. We're looking for a little more refinement. Tea should be traditional. Save your healthy green teas for another time. Afternoon tea should be Darjeeling if you want to be conventionally correct. Earl Grey might be tolerable but check that your guests are not averse to its flavour. Finger sandwiches are usually made with soft white bread but brown is perfectly acceptable and works well with cold salmon or watercress. Afternoon tea is not a time to go for strong or disctinctive flavours in sandwich fillings. Fresh summery options like mackerel pate, smoked salmon, salted cucumber or very thinly-sliced roast beef are ideal. English cheddar with a hint of Branston pickle is also acceptable. Scones are a cornerstone of an English afternoon tea. Fruit or plain scones should be accompanied by thick clotted cream, butter and jams (served in tiny saucers rather than straight out of the jar). Don't overdo it on the cake front. A single and stylish home-made Victoria sponge or Battenburg will impress. Those determined to drag a modern element into afternoon tea might opt for miniature cup cakes, although aristocrats would regard this as a tad vulgar. Getting your afternoon tea recipes spot on is just the beginning. The ambience is key to making your afternoon tea the ultimate in refinement. Break out the best china, serve leaf tea with a strainer and silver teaspoons and check the cupboard where you stashed all the old wedding presents to see if you still have that old cakestand.